Political Insight and the News They Don't Tell You. There have been many comparisons of the Bush years as being the second coming of the Roman Empire. Would that it were so. Let’s just take a look at how Rome was run, government-wise and put these odious comparisons to bed. They also had term limits and a wide range of requirements necessary to be considered worthy of holding public office. Firstly, for every office there were at least two incumbents, neither of which had seniority over the other. Holders of public office (and hence, public trust) were limited to a term of one year of service and weren’t permitted to run for and be re-elected to the same office for ten years. This, some might say, would prevent anything from getting done, but one must remember that the main impediment in the geological-age slowness of bureaucracy is that it is no longer designed to serve the average citizen, but to be used as a tool of political leverage to gain and maintain power. If you have no answers to the problems you’ve created, then in order to look less incompetent, you must prevent the opposing party from solving those problems by blocking them in every step of the legislative process – delaying hearings, blocking testimony, preventing quorum, filibustering and poison-pilling bills. It would also free us from such people who use their office to line their own pockets such as the disgraced 8-term Repug Congressman Randy Cunningham or superannuated old hacks like McCain. Further, Senators had to serve two to three years in lower offices such as quaestors, tribunes, aediles or praetors before being eligible for higher office. All office holders could veto the acts of office holders of equal rank and superior ranks could veto decisions of lower ranks. I suppose this might be the equivalent of the “signing statement,” although there was no evidence that this power was used trivially. The one exception to this overall system was in times of national emergency when the Senate, realizing the necessity of swift and decisive action, would confer the title of “dictator.” This singular office was immune to veto authority but had strict time limits. A Dictator could only hold office for six months or the duration of the emergency, whichever was shorter. Once a person was finished holding the office of consul or praetor, he would be posted as governor of a province under the title of Proconsul. This title has sometimes been attributed to Paul Bremer who was appointed as the defacto “ruler” of immediate post-war pre-election Iraq, whose monumental incompetence essentially created the insurgency and wasted billions of US dollars while simultaneously allowing Iraq to be looted. A Roman proconsul would have previously served as his nation’s highest executive officer and would have had significant military combat experience. This was due to the requirement (during the Republic) that any candidate for public office of any stripe have previously served in at least ten military campaigns. Bush’s Air Guard experience would have been considered the equivalent of the Boy Scouts and Cheney wouldn’t have been able to be elected sewer commissioner. Just a word on the Tribunes. Their creation was to protect the plebeians – the common folk – and their property. To this end, they had tremendous power. They could veto elections to and laws passed by the Senate (of which they were considered ex-officio members) and could basically reverse the decisions of any official save the Dictator. The modern Congress is supposed to be able to fulfill some of these functions, and could if they could find their collective balls. Roman upper-class was essentially divided into two groups the Optimates, or “best men,” (at least in their own estimation) and the Popularis – reformers – reformers who stood up for the rights of the people. In other words, the Republicans and the Democrats, a very generalized statement but essentially correct. This is not to say that the Romans had a perfect system. It was a good system that was corrupted by ambitious men, much like the American system under Bush, but it had other problems as well. One of the traditions of Rome was to only accept property-owning men into the army. The general Caius Marius changed this, making Rome’s armies not a group of conscripts but a volunteer army of long-serving professionals. To do this, Marius waived the property clause. However, it then became tradition to grant retiring soldiers who had served 20 to 25 years with a farm. Trouble was, most of the land in Italy was owned by the nobility who were the chief beneficiaries of Rome’s wars of conquest. Where would the new land be found to grant to retiring soldiers of a huge Imperial army? The traditional way – you take it from someone else. 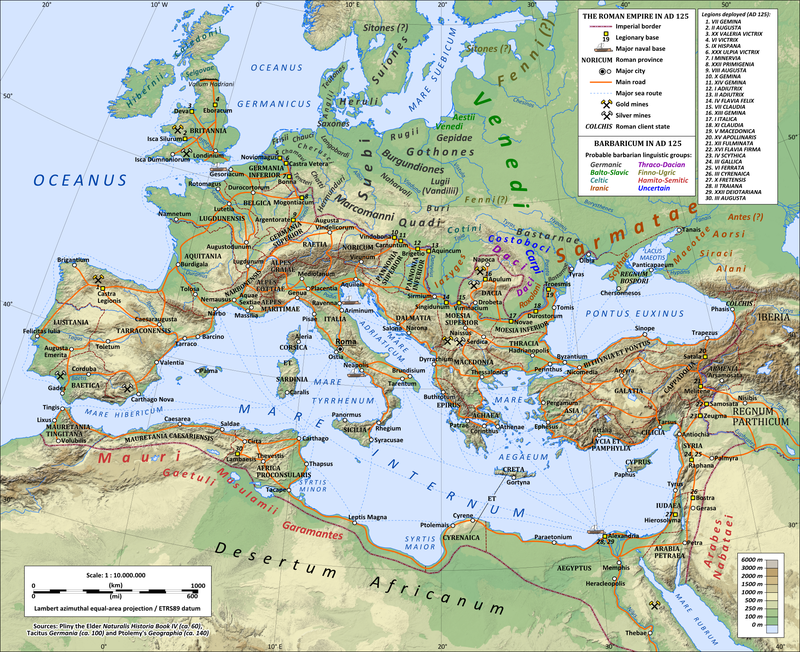 This kept Rome expanding until it was impossible to police the Empire without hiring mercenary troops. When the enemy hordes are coming over the Seventh Hill, this is not the time to realize that the city’s Praetorian Guard is made up primarily of Goths. Under the Bush regime, the US extended its military to the point when it felt compelled to hire mercenaries and outsource many of its support services to private corporations. America’s right wing imperialist leanings came out of the closet right after 9-11, being espoused by conservatives in a blatant unapologetic manner. Whereas many point to the Pax Romana model, there are others who claim America is the 21st century inheritor of the British Empire. Both images are troubling.